Calling on our WHA whanau to share your health journey! We are excited to be launching this new project with the aim to connect the WHA community and empower women and whanau! 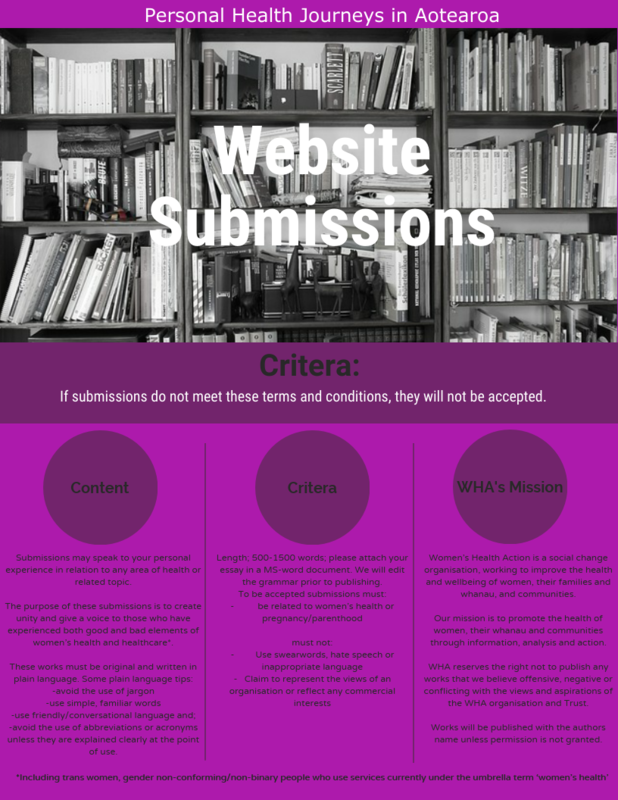 Click here: Website Submission Criteria for more information. In one month, it will be illegal to use surgical mesh products to treat pelvic organ prolapse in Australia. Photo: Lynn Grieveson Read about Australia’s progress here! We want to hear from you! Get in touch on Facebook here or email us at info@womens-health.org.nz. A nationwide shortage of the oral contraceptive pill has pharmacies worried they may have to start turning women away. Read more about the situation here. The Lakes DHB have updated their breastfeeding resources. Check out the pdf here and hop over to their webpage to make an order!